Moonlit Spring Evening is an Etsy Treasury, a grouping of lovely items available at Etsy, curated by Caitlin Sainio. She purchased my print "Twilight" and says it was her inspiration in creating the above. Caitlin is an engineer turned stay at home mom who acknowledges, "I like to make things and draw things, and I especially love to crochet: it's like engineering with thread!" To see the Treasury up close and to check out individual items click here. 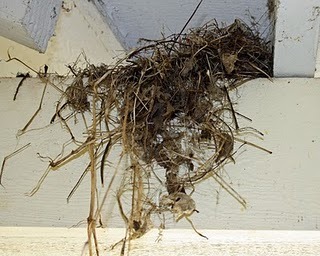 In my last post I told you about the Junco Family building their nest in the eaves of our front porch again this year. 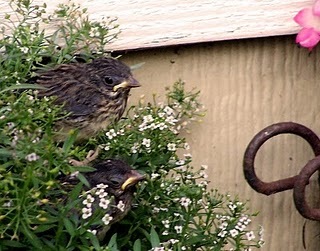 Yesterday during a stormy spring rain the little babies all flew off and into the soggy landscape with Sophie kitty chasing after them.